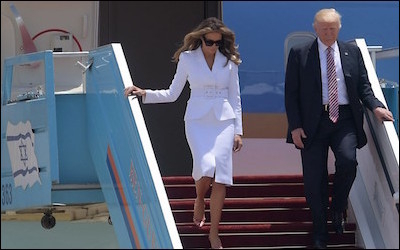 President Donald Trump arriving in Israel on May 22. In Saudi Arabia on Sunday, President Trump declared unswerving American commitment to help Riyadh in "confronting the crisis of Islamic extremism and the Islamist and Islamic terror of all kinds." A new coalition of American lawmakers believes he should make an equally important commitment to Israel when he lands there today. Official U.S. policy on the Israeli-Palestinian dispute has long been centered on a "grievance-based approach" to conflict resolution and counterterrorism. Addressing the stated grievances of Palestinian extremists, the reasoning goes, reduces their motivations for fighting and enables their leaders and those of Arab states to make peace. Thus the perennial goal of American diplomacy has been to pressure or coax the democratic State of Israel into making concessions to the authoritarian PLO-turned-Palestinian Authority (PA) in hopes that they will placate the Palestinian masses (most of whom, including 1.6 million in Hamas-ruled Gaza, do not live in disputed territory). While the "land for peace" formula -- pressuring Israel to hand over land to those it has defeated for the promise of peace to come -- pleased Arab governments and career diplomats at the State Department, it was a disaster on the ground. Each new concession was seen by Palestinian leaders as signaling an Israeli weakness ripe for exploitation, stoking their fantasies of ultimate victory and thus prolonging the misery of the Palestinian people and everyone involved. History shows that wars end definitively only when one side has no more hope at all of success. History shows that wars end definitively only when one side has no more hope at all of success, as happened in Germany and Japan after World War II. Of course, unconditional surrenders of the kind that took place on the deck of the USS Missouri in Tokyo Bay have been rare since the creation of the UN shortly thereafter. Wars often linger on for years, even decades, as winning sides are dissuaded by international pressure from bringing conflicts to an end. 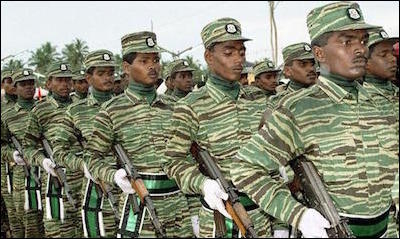 Sri Lanka ended three decades of turmoil and violence by defeating the Tamil Tigers (above), not by resolving their grievances. An old-school exception to this rule came in 2009, when Sri Lanka broke free of its decades-old cycle of conflict with the separatist Liberation Tigers of Tamil Eelan (LTTE). Eschewing yet another round of negotiation, followed by impasse, terrorist strikes, and government retaliation, the government launched a decisive, all-out war to defeat the LTTE and fully reclaim the northern part of the island nation. Since then, Sri Lanka has been effectively terrorism-free. Tamil nationalists still have their grievances, of course. But with Sri Lanka having risen over the past eight years to become"South Asia's most prosperous country" and an oasis of calm considered to be "at the forefront of the hot destinations queue" for South African tourists, few feel aggrieved enough to pick up a gun. Israel's situation is not so very different than that of Sri Lanka. The Palestinians still have not given up their fantasy of a Palestinian state "from the river to the sea." The best way to advance a peace process is by convincing Palestinians of Israel's insurmountable strength. The best way for Washington to advance a peace process is by convincing the Palestinian leaders of Israel's insurmountable strength. "After the leadership recognizes this reality, the Palestinian population at large will follow, as will eventually other Arab and Muslim states, leading to a resolution of the conflict," explains Middle East Forum President Daniel Pipes, the driving intellectual force behind the newly-created Israel Victory Congressional Caucus. If President Trump really wants to succeed where others have failed in resolving the Arab-Israeli conflict, he should demonstrate that the U.S. supports its Israeli ally unreservedly. He might start, for example, by announcing from Israel this afternoon that the United States is moving its embassy to the country's capital of Jerusalem.